Krabi is quickly becoming a popular tourist destination with miles and miles of spectacular coastline, towering limestone cliffs, lush interiors and beautiful white sand beaches on the Andaman Sea. It still remains relatively untouched and retains its lovely charm. Krabi province includes over 200 small islands with top destinations being Hat Noppharat Thara, Ao Nang, Koh Lanta, Ko Phi Phi and Railay. We’ll concentrate our focus on Railay but a visit to Phi Phi is a must! 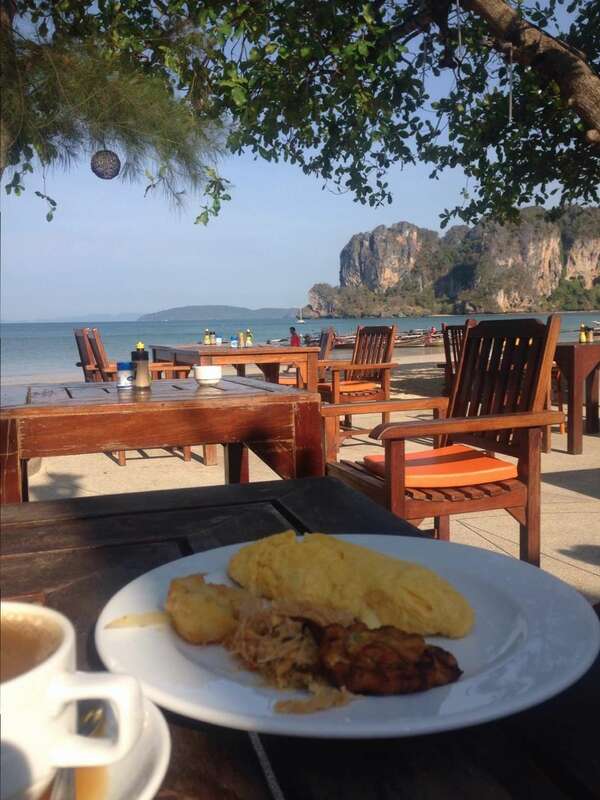 The ideal time to visit Krabi is November to May. You’ll find sunshine all day but because Krabi is sheltered by mountains it gets cool and breezy at night. August and September tend to be the rainy months! Krabi is located on the south-west coast of Thailand, approximately 800km from Bangkok and 170km from Phuket. You can reach Krabi by plane, bus, car or boat! Krabi Airport is small and convenient and you can currently fly into Krabi from Bangkok, Chiang Mai, Koh Samui, Singapore and Kuala Lumpur. Many larger hotels offer transfers from the airport for a fee or there are efficient, regulated taxis available. The standard prepaid fare to hotels in Krabi town are 350 baht per car; 600 baht to Ao Nang; and 900 baht to Klong Muang/Tubkaek. There is also an airport bus service serving destinations in Ao Nang and Krabi town only for 90-150 baht per person. Buses leave 5 times daily or when there are enough passengers to fill them. 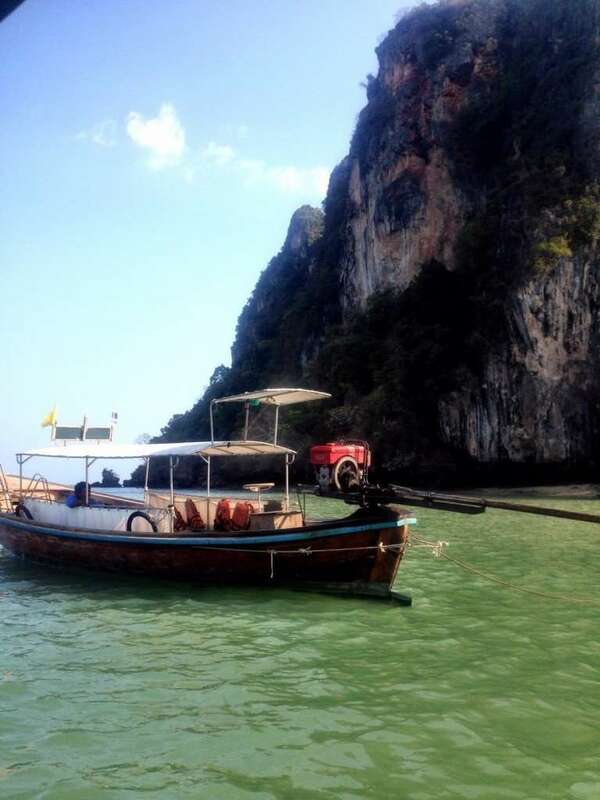 Railay is only accessible via a short long-tail boat, you can hire one at the Ao Nang pier! Buses for Krabi leave from Bangkok’s southern bus terminal on Boromratch Chonnani Road with a cost of 626-920 baht but the journey time is 10 hours. If you’re planning on driving to Krabi, the road network in Thailand is excellent and the highways are easy to follow. If you are traveling from Phuket, you can arrive at Ao Nang by a ferry operated by Ao Nang Travel or a faster speedboat operated by Green Planet. The ferry leaves from Rassada pier and the speedboat leaves from Bang Rong pier. Lodging options in Krabi range from simple beach bungalows to opulent five-star mega-resorts. You won’t be disappointed staying in Railay Beach, one of Thailand’s most sought after beach areas with no roads or cars, just longtail boats and footprints. Just south of Ao Nang Beach and accessible only by boat, Railay’s gorgeous white sand beaches, soaring limestone cliffs, viewpoints, caves and a lagoon hidden inside the cliffs will astound you. Railay is only accessible by boat due to the tall limestone cliffs casting it away from Krabi province mainland. 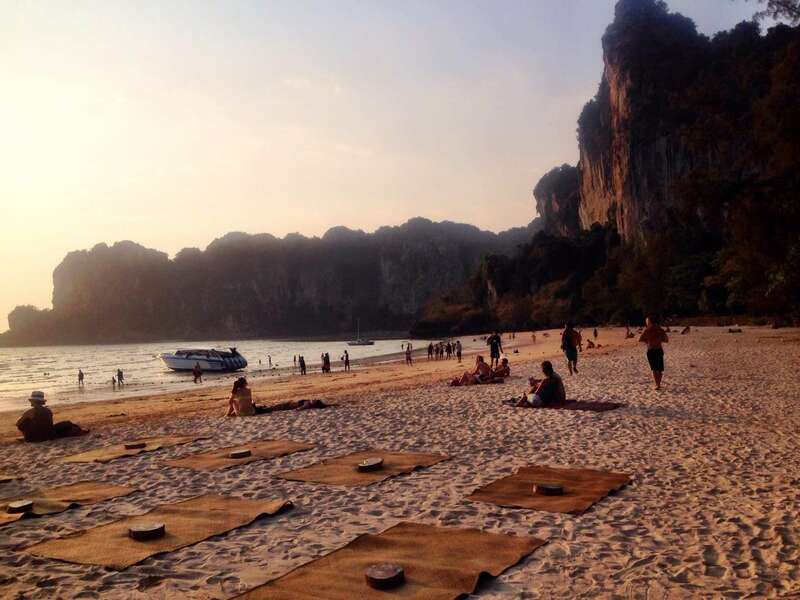 Railay West has a beautiful beach with amazing sunsets while Railay East has the nightlife (both are within minutes walking distance of each other). 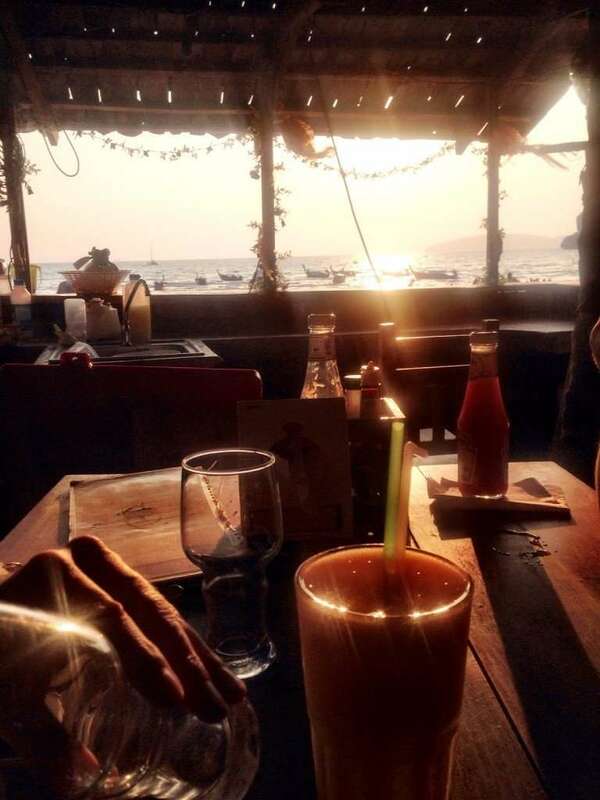 Relax and have a sunset drink while watching the sun go down at Flame Tree Restaurant, the first restaurant situated on the walking street in Railay West. The sun sets in the west, making Railay West THE spot to watch the sunset. They also have mats they put out on the sand so you can lounge outside while watching the fiery sunsets. Don’t expect. stellar service so get your drink then go enjoy the atmosphere. It’s an amazing experience to share the same moment with all the people in the world who also happened to end up at this same place as you. Continue down the walking street until you reach Local Thai Food Restaurant, a bamboo and thatch restaurant located on the footpath leading to Diamond Cave between Railay West and Railay East and the best restaurant in all of Krabi in my opinion. It’s wonderfully simple with a relaxed and laid back atmosphere, fair prices and excellent cuisine. The menu consists of traditional Thai dishes and fresh seafood. The barbecue prawns and Penang curry are to die for. The Mangrove Restaurant next door received higher ratings but it does not live up to the hype…skip it! 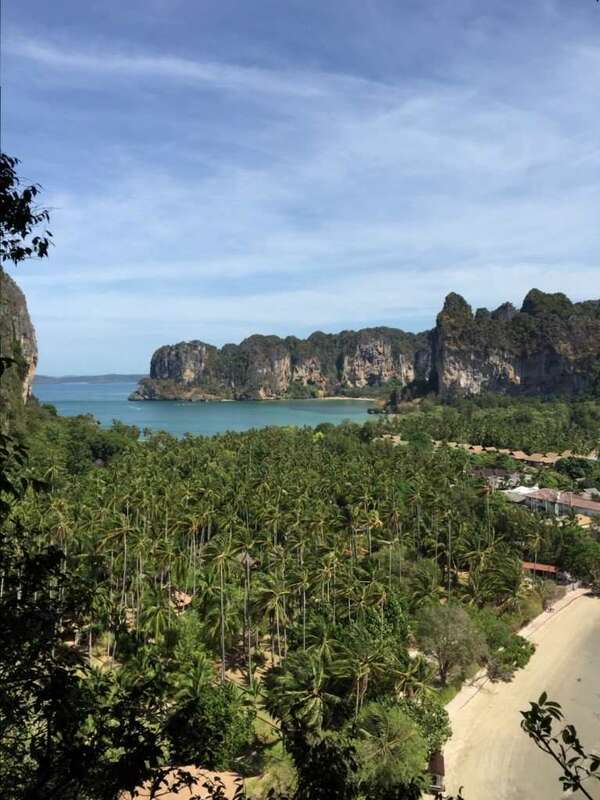 Check out Railay’s four incredible beaches situated between towering limestone cliffs (accessible only from the sea): Tonsai, Railay West, Railay East and Phra Nang. Railay West is one of the south of Thailand’s most impressive, atmospheric and beautiful beaches with casual beach restaurants and perfect soft sand. The beach faces west so it’s the perfect spot to sit and watch the remarkable sunset. A pathway straight across across the peninsula links Railay West with Railay East. Railay East can appear slightly rough but is the center of nightlife in the area. It’s a narrow beach (one where you wouldn’t want to sunbathe in) and home to mangroves, fishing boats, birds and the most convenient place to catch a long-tail taxi boat to Krabi town. 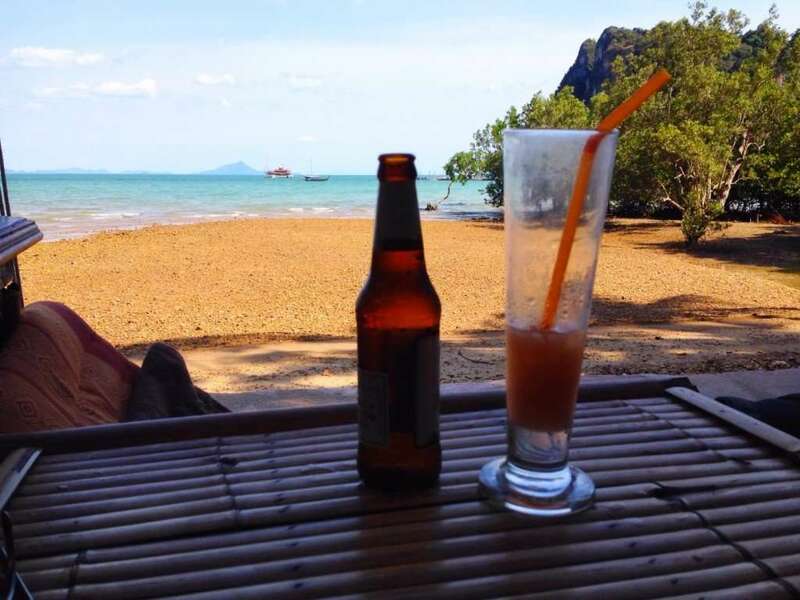 There are numerous restaurant bars like the Friendship Restaurant with padded seats and tables on the floor of wooden platforms so you can kick back and enjoy a beer or pad thai while you feel the ocean breeze on your bare feet. I’m a huge fan of the chicken skewers that you can get at the stands in Railay East. They go perfectly with a bag of delicious sticky rice and sweet chili sauce! Skewers and sticky rice…my go-to! Phra Nang is the least developed of the four (except for the elaborate Rayavadee resort) and has silky soft white sand. Most people arrive at Phra Nang by boat and are amazed by the beautiful cove but you can also walk there at low tide. It’s about a 15-minute stroll from Railay. You can walk along the beach at Railay East along the base of the cliffs bordered by caves and stalactites to Phra Nang beach. Look out for the monkeys! Check out the Princess Cave or Tham Phra Nang Nok at the bottom of the limestone cliffs, dedicated to an ancient fertility goddess that contains a strange amount of large phallic symbols and offerings in the hope of increased potency and prosperity. 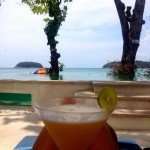 Read my post on Phra Nang beach and the amazing boats that serve hot, fresh Thai food to you right on the sand here. You can walk between all four beaches, even to Tonsai by walking through the jungle. Don’t believe the crooked boatmen who tell you it’s not possible to reach Tonsai on foot! Quieter than all the other beaches, Tonsai is the place to relax and unwind. If you are able to get a reservation, dine at The Grotto at the exclusive Rayavadee Resort, a stunning and unique restaurant set inside a spectacular limestone cave floored with fine-powdered sand and a magnificent opening to the beach. The Grotto features fine Thai and international cuisine, an extensive cocktail and wine list and an irresistible romantic setting. The price is quite lavish but the experience is unforgettable. You won’t be able to dine without a reservation. For a night on the town, hit the Last Bar, named because it indeed used to be the last bar on the strip. The multi-level tiki bar with a terrace overlooking mangroves is not only the perfect place have breakfast, lunch or dinner but you can also experience Muay Thai demonstrations and fire dancing shows when the night falls. This is the place to be for full moon parties and their happy hour prices can’t be beat (cocktails for 100 baht)! Krabi’s limestone cliffs are a rock climber’s paradise with plenty of climbing opportunities whether it be the challenge of an overhang or a vertical wall. Over 650 routes have developed since the late 1980’s that follow limestone crags, steep pocketed walls, overhangs and hanging stalactites. Some are accessible by boat while others can be reached via a jungle walk. Check out the climbing schools located at the end of Railay East! If you’re not a rock climber but would still like a challenging hike, tackle the hike to the viewpoint and the hidden lagoon. You’ll find the start to the hike on the path from Railay East to Phra Nang beach across from a small shack with a few safety instructions. Look for a set of ropes hanging down a set of steep rocks on your left hand side. You’ll be using those ropes on the 20-minute or so strenuous climb to the viewpoint. Wear good shoes and clothes that you don’t mind getting dirty because you will be orange from sliding and climbing on the muddy rock. 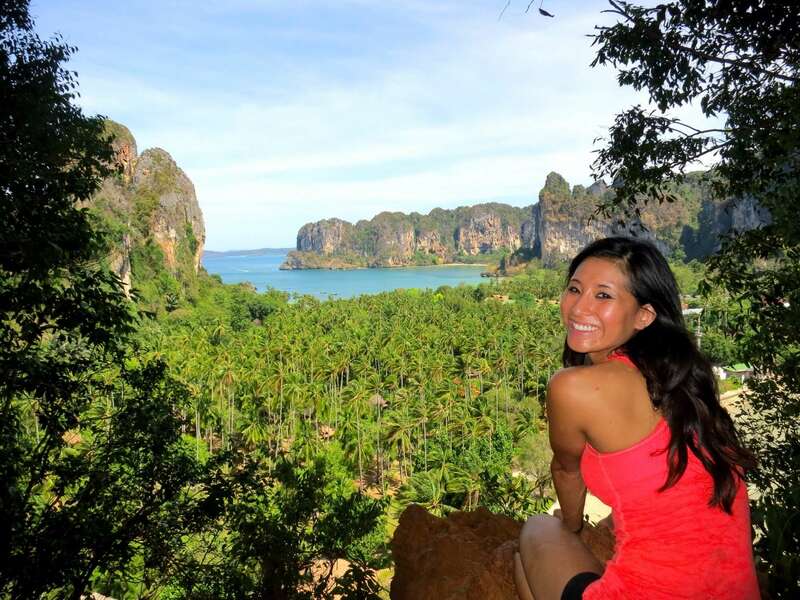 The view from the top is worth it with Railay West on your left, Railay East on your right and a remarkable grove of coconut trees in between. If you’re feeling up for a challenge, continue the climb to the lagoon. The turn off for the lagoon is a sharp right just before the viewpoint and the climb consists of scaling four vertical walls. At parts you must use the ropes provided to get down. 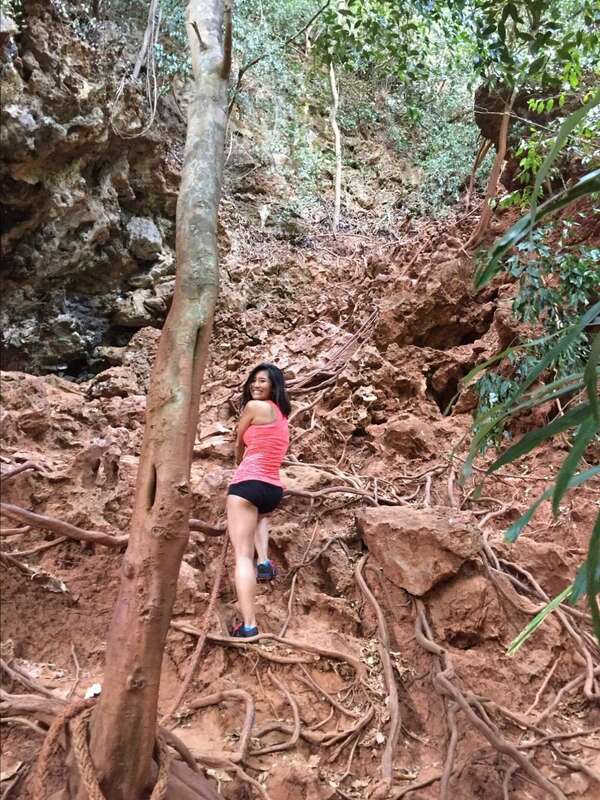 I was satisfied with just completing the hike to the viewpoint because several people that we met on their way down expressed that they had tried the hike to the lagoon but that the last leg of the climb was too steep so they turned around. The lagoon is tidal so try and make sure that it’s high tide when you go or else you might just find a small muddy pool. Once you reach the lagoon, you’ll find a pool surrounded by sheer cliffs and lush vegetation. 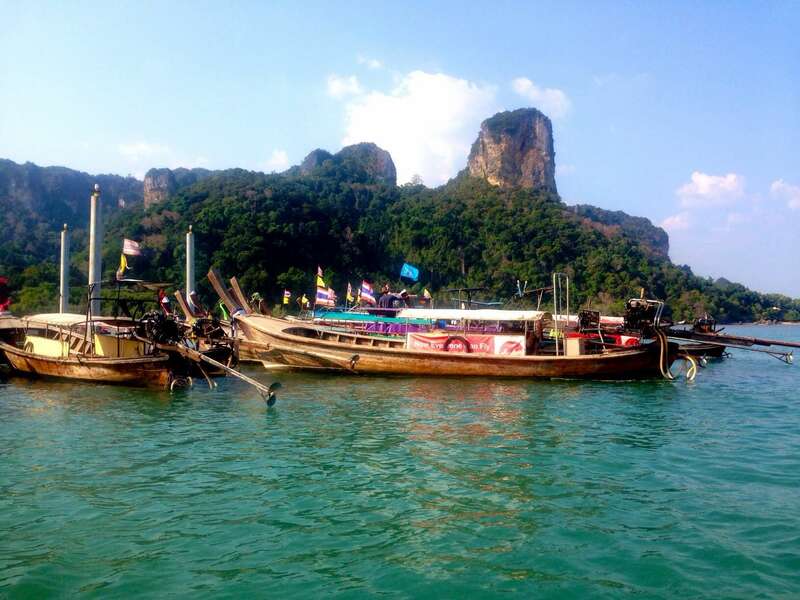 Alternatively, you could also hire a long-tail boat to take you island hopping to some of the 200 islands around the Krabi coastline. For example, you can cruise Phra Nang cave beach, Chicken Island, the Tup Islets and Poda Island in a day for approximately $50 USD for a private long-tail boat. 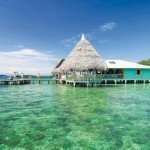 The snorkeling and sunbathing on these beautiful islands with lovely white sand beaches can’t be beat. If you’re arriving at Railay Beach, be aware that there is no pier at Railay so dress accordingly to walk ashore from the boat through shallow water. The tides are dramatic in Railay. You can walk from Railay West to Phra Nang at low tide and even to the picturesque limestone cliff that juts out from the beach without kayaking or swimming. Many of the hotels like the Sand Sea are muslim so will not serve alcohol. Even better, you can buy your favorite bottle and enjoy it with your dinner and amazing view. Try a traditional Thai pancake (roti). You’ll pass several stands making the with all sorts of flavors. The condensed milk is my favorite. Bargain with the street vendors when purchasing goods. Start your offer at half of their asking price. 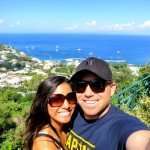 This was probably the most helpful blog post I have seen yet for planning my own trip! Thank You! I’m so glad it was helpful! Enjoy your trip! Thanks for the detail post. I would change my plan going here instead of Phuket! You’ll love it! Safe travels!